Freydis was one of the leaders of a dangerous expedition to Vinland. Many perils awaited her and her group: hunger, disease and strange natives with unknown forces and tactics. After her arrival, things were quick to become sour: relentless attacks made her allies weakened and fearful. During one of such raids, she saw her allies and warriors fleeing the battle. But she would not budge. Grabbing her sword, she proceeded to inflict herself a terrible wound to show her comrades she would not back down. With an inspiring battlecry, she charged head first into battle, which shook her allies, who came to her side. The sword she held this day became legend, and many believe they will never know fear while holding it. Freydis is the first sword to feature our new handle. Brass-coloured, the guard and pommel surround a leather-like handle, adorned with brass rings. Its thin blade is silver for an added realism. 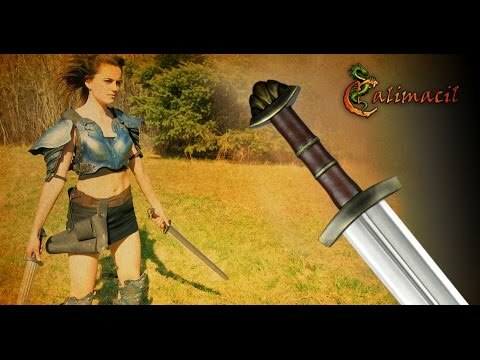 The whole sword is made of the safest foam there is: the Calimacil foam. 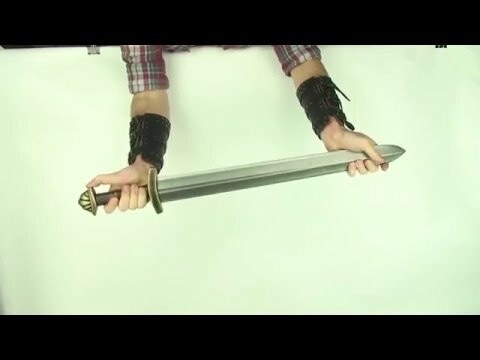 With its increased durability and safety, the sword will remain to your side for years. This blade was made with Vikings in mind. However, many other germanic characters can use it to its fullest, such as barbarians, noblemen and shieldmaidens. However, it’s not because this sword is prestigious that Orcs and dark liches can’t profit from its sharp blade, so stay alert!